Free Wella Professionals Invigo Nutri Enrich Deep Nourishing Shampoo + Mask on Purchase of products from Invigo and EIMI Ranges worth Rs 1200 and above. 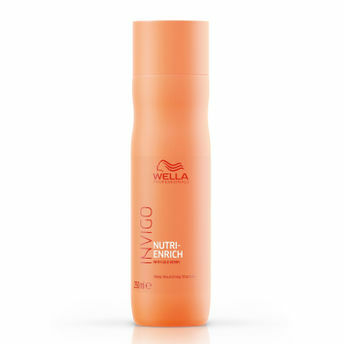 Wella Professionals Invigo Nutri-Enrich Deep Nourishing Shampoo, is a moisturising hair shampoo with NUTRI-ENRICH-Blend. Enriched with goji berry known to be extremely rich in vitamins, minerals and peptides, it deeply replenishes and moisturises dry and stressed hair. Formulated with vitamin E to protect the hair from further damage, optimum hydration is restored courtesy of panthenol and oleic acid contained in Wella’s unique Nutri-Enrich Complex. This shampoo offers instant, deep nourishment for; smoothness, manageability and movement. About the Range: Discover the INVIGO Balance Scalp Care products from Wella professionals at Nykaa. Wella Invigo Balance deals with all scalp issues thanks to its INVIGO-Blends technology. Backed by more than 135 years of expertise, Wella Professionals creates recharging moments in salon and at home with high-performance hair care treatments for all needs. Nurture, invigorate and revitalize with specially-developed collections for colored hair, blondes, delicate hair, scalp and dry hair.